Janessa Robinson will soon join the ranks of the mega loan club. Janessa Robinson will soon join the "mega loan club" of college graduates with over $50,000 in student debt. The 24-year-old didn't intend to join those ranks, but her bachelors' degree from Tulane University left her nearly that much in debt, and she plans to start graduate school soon. "The price of education is egregious," she told CNNMoney. Almost 19% of student loan borrowers owe more than $50,000, according to a report published last week by the Federal Reserve. Only 6% of borrowers had that much in 2001. Student loan debt now outstrips credit card and auto loan debt in America. Robinson is one of many young college graduates financially stretched to cover both living costs and student loan payments. She pays $275 a month toward her current loans while working an entry-level job at a non-profit in Washington D.C. Her next step is a graduate degree in public policy. It will mean taking out additional $43,000 -- the same amount as her current annual income. She's considering going on forbearance -- a time period where borrowers don't have to make payments but interest on the loan accumulates -- while she attends graduate school. Despite the high costs, she still thinks her education is worth it. The statistics support her belief. People with college degrees have higher lifetime earnings, better employment opportunities and significantly lower poverty levels. 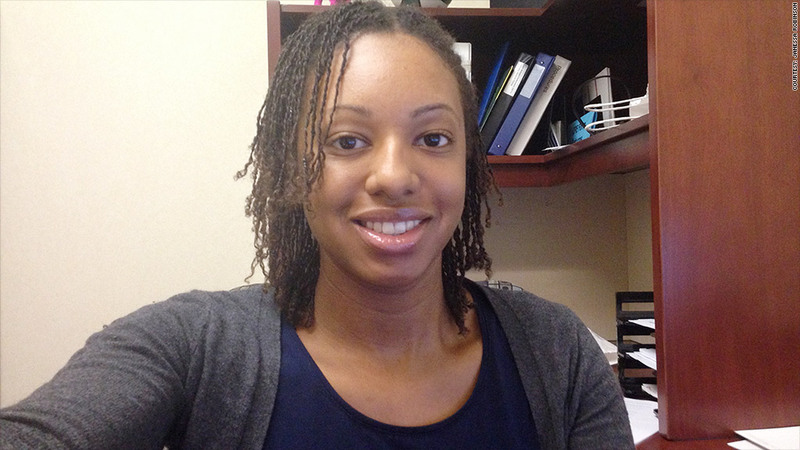 "My degree has put me in a position where I can get an entry level job," Robinson said. 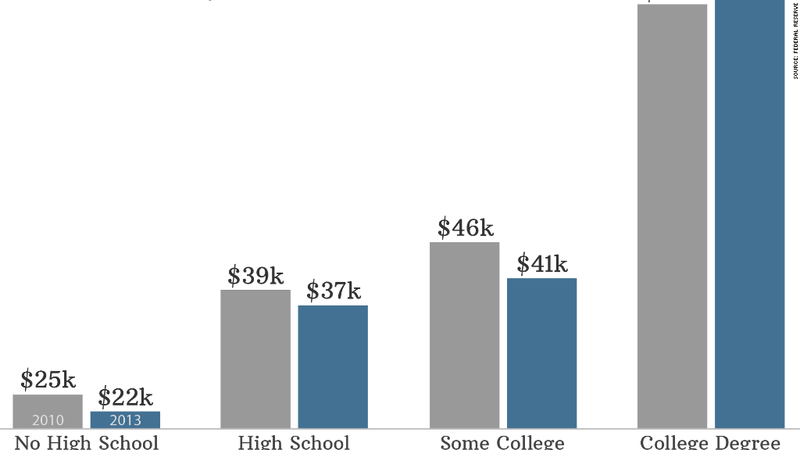 Only workers with Bachelor's degrees saw their median incomes rise between 2010 and 2013. Everyone else saw a decline, according to the Federal Reserve. It was especially harsh for those with only some college such as an Associate's degree. "We're in this odd status quo where we're questioning the value of a college degree, particularly in light of student debt," said Andrew Kelly, director of the Center on Higher Education Reform at the American Enterprise Institute, a right-leaning think tank in Washington. "Some form of post-secondary education is more important than ever before because other groups are worse off," he added. Jefferey Jackson is still waiting for his degree to pay off. He earns $24,000 working at the library of his alma mater, Georgia Southern University, after earning his bachelors and his masters. Jackson, 29, had no financial support from his family, which he says is poor, to pay for college. He took out $88,000 in loans to pay for his two degrees. He cannot afford loan payments on his salary, and his job does not require his degrees. "It's something I'm really proud of myself for doing," said Jackson, who hopes to find a state or federal government job. "I would definitely say the investment is worth it. If the opportunity presents itself, go after your dreams." While the mega loan club is growing, the majority of student debtors, 64%, hold $25,000 or less in student loans. Student loan debt is also not a burden only for young graduates. Less than 40% of all student debt owners are under the age of 30, according to a report by the Federal Reserve Bank of Kansas City.